The Gunk Haus blog has been quiet the last few days, that's because I have my brother and his oldest son visit right now, and obviously we wanted to take them around a little bit. 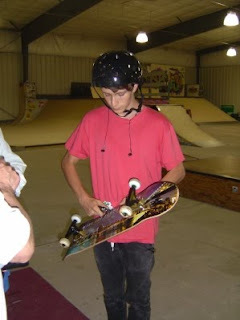 Taking around is a little far fetched, because my nephew is a skateboard fanatic, and so we took him to get a board, and to a skate park nearby. But today they ventured to the city, New York City that is, so we had no more excuse to procrastinate. So our day was filled with painting, installing lights, caulking, etc. Nothing exciting, but the little things also need attention. 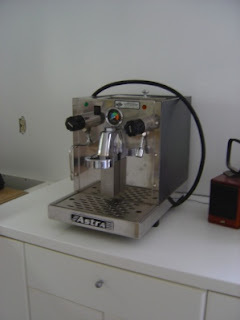 The highlight of the day was the arrival of our latest, and pretty much last, major piece of equipment, a pour-over espresso machine. E! had been lusting for one for I don't know how long. Espresso anyone? Cappuccino? Macchiato? I'll put in my standing order for everday around 7:30 am for a large hot chocolate with extra whipped cream for on my way to work. Danke! -A!